Friends remain puzzled by the man's anguish, a public torment that is at once spectacular and unnerving. Over the years it has abated somewhat, and the man's wife reports that so far, as the NBA playoffs near, her husband's stomach has not required its seasonal medical attention. This is a good sign, you don't know how good. Once, when he was still coaching the Los Angeles Lakers, he didn't speak to her for three weeks. It was their first year of marriage, and she was too scared to talk to anyone but her mother about it. Later he told her it was nothing personal. It was playoff time. Another good sign: It used to be that after a Laker loss, his mood might require her to seek another ride home. But when a division rival pasted the Lakers recently and Magic Johnson went down and out with an ankle injury (that is to say, the world came to an abrupt and fiery end), the family repaired to a movie that he actually remembers seeing. "He even spoke to us," says his wife. So, good signs all around. Yet—good signs aside—he maintains a strange misery that neither friends nor success can lift, a cultivated gloom that, like his clutch play for 14 Laker seasons, is practically a work of art. Who wouldn't want to be Jerry West, to achieve all that he has? 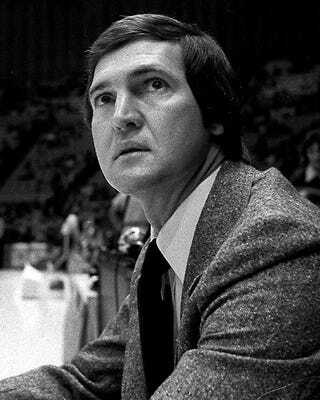 Who would dare dream the life Jerry West has led? Not even Jerry West—Zeke from Cabin Creek, dribbling a ball on the West Virginia dirt on winter nights 40 years ago, a country boy's solitaire—could have created this life from his imagination. "I was my own best friend," he says of those days. "I was everything, actually. Player, coach, announcer, even the timekeeper. It was amazing to me how many times in those imaginary games there'd be one second left, my team one point down and me with the ball, and I'd miss and—the really amazing part—there would still be time for another shot, or 10." Not that many years later, the timekeeper no longer his best friend, he would make a 60-foot shot at the buzzer to send a 1970 NBA championship game into overtime. Not even his dreams, as fevered as they may have been in the Appalachian twilight, anticipated the glory of real life. Real life: West became one of the greatest guards to play the game, a perennial All-Star, a rich man, later a winning coach and, after a brief retirement to country-club life and a one handicap, the architect and curator of the 1980s' dominant professional sports franchise. Life's lottery winner. As general manager of the Lakers since 1982, West is the man who risked the 26th pick in the '89 NBA draft on Vlade Divac, strictly a Yugoslavian novelty act (popular opinion), and came up with Kareem Abdul-Jabbar's successor for the next decade or so (new popular opinion). After everyone else passed, West took a chance on A.C. Green out of Oregon State and developed a Laker mainstay. He stole Mychal Thompson and Orlando Woolridge to keep Magic surrounded by winners. And now the Lakers are going after NBA title No. 6 in 11 years. Does West have a golden touch? "Well," says Pete Newell, his longtime friend and onetime boss, "he's the only guy I know who went into oil for a tax loss and struck a gusher." So watch West at a Laker game, enjoying all this success: He covers his eyes, pounds the armrests of his seat near a Forum tunnel—"It feels like an electric chair," he says—jumps up and...leaves.